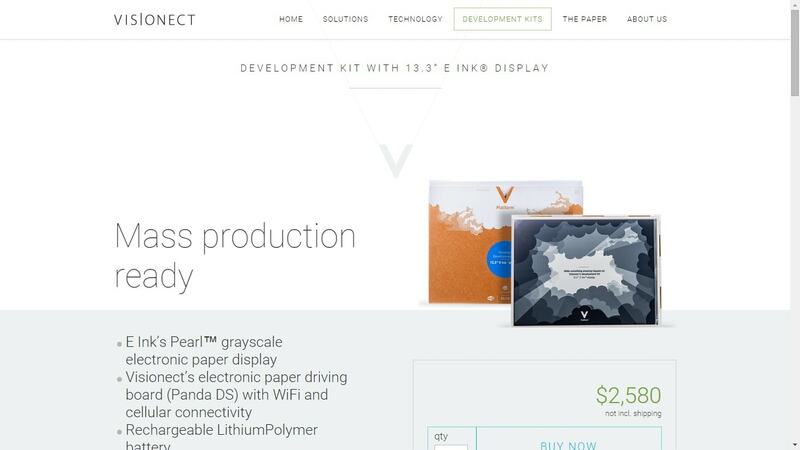 E-ink has long made screens for its partners to put in DIY kits and development kits, and now they have a partner who has decided to go large or go home. For those who aren't familiar with the name, Visionect first came across my desk early last year when I first came across Visionect's thin client product. This company had developed a wireless monitor slash thin client solution based on a 6" E-ink screen. When paired with a remote computer of some kind, Visionect's device could be used to fill a variety of uses ranging from a digital menu to a wireless control unit for a boat's navigation/control system (the Nautipad Display from Weimar). Visionect's earlier product was based on a 6" screen, but there was no reason that the tech couldn't be adapted to E-ink's larger screens (or smaller screens for that matter, which is why Visionect was at a digital signage trade show). Last week Visionect debuted their first two plus-sized development kits, one with a 9.7" E-ink screen and the other with a 13.3" screen. Both units have wifi and cellular connectivity, but there's no mention of a touchscreen, thus limiting the interactivity possibilities. The 9.7" unit has a screen resolution of 825 x 1,200, while the 13.3" unit as a screen resolution of 1,200 x 1,600. The screens come mounted on a plexiglass frame along with a rechargeable LiPo battery and one of Visionect’s Panda DS board (which drives the signage). The development kit is of course intended more to be a prototype than a finished product, so it is far less polished than Visionect's V Tablet system, which is based on a waterproof 6" screen unit. That smaller design is also available as a DIY kit, albeit at a much lower price.